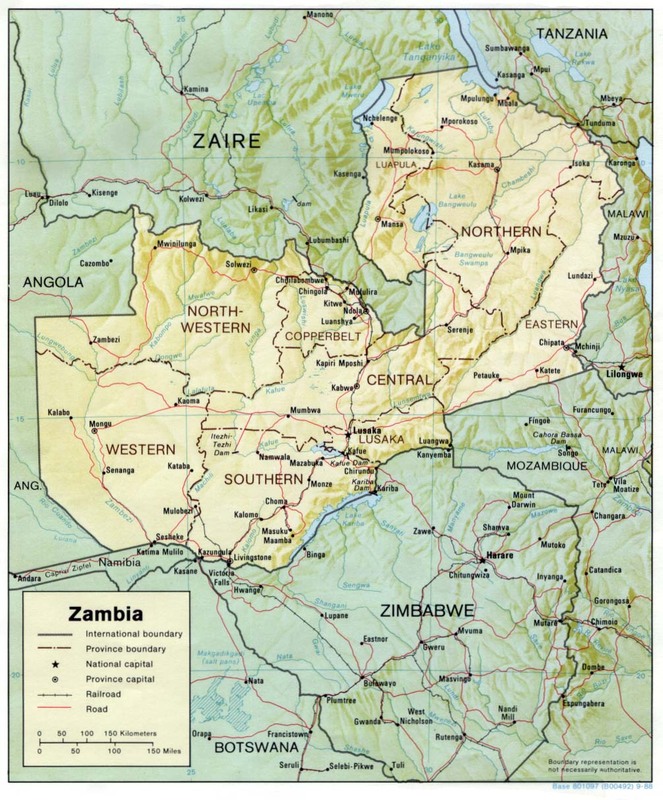 Zambia(ˈzæmbɪə) is bordered by Angola, Democratic Republic of Congo, Malawi, Mozambique, Namibia, Tanzania, and Zimbabwe. The total area is 752,618 sq km. Lusaka is the capital. English, Bemba, Tonga, Nyanja, Lunda, Kaonde, Lozi, and Luvale are official languages. The population is 13,460,305, with a life expectancy of 52.03 years. The ethnic breakdown is 21.5% Bemba , 11.3% Tonga, 5.2% Lozi ,5.1% Nsenga, 4.3% Tumbuka, 3.8% Ngoni, 2.9% Chewa, and 45.9% other. Zambia is 50%-75% Christian , 24%-49% Muslim and Hindu, 1% indigenous beliefs. The literacy rate is 86.8% male and 74.8% female. Zambia was the site of several kingdoms and polities. The Lunda Kingdom, the Lozi kingdom, the Bemba, and the Ngoni dominated the region. The region became known as Northern Rhodesia and conquered by Harry Johnson of Cecil Rhode's BSA company. Bemba and Ngoni put up stiff resistance to the British, but could not withstand the supremacy of the maxim gun. The Ngoni was mowed over by machine guns, putting an end to their century-old supremacy in the region. In addition, the Bemba was also weakened by disrupted trade due to colonialism and dynastic disputes. The British justified their conquest in the name of ridding the region of tyrannical rule, but proceeded to confiscate all the best land and cattle for white settlers. Whites dominated the government and population with South African style Apartheid. In 1953, attempt at federation of Nyasaland (Malawi), Northern Rhodesia (Zambia), and Southern Rhodesia (Zimbabwe) by the white minority governments encouraged activism of african nationalist groups, who saw the thrust of federation as an act of more marginalization of native african populations. In the latter part of the 1950s, demonstrations, boycotts, and strikes became pandemic. The Northern Rhodesian National Congress was at the forefront of this movement. The movement adopted the name Zambia for the country. The Zambia African National Congress was banned in 1959, but soon replaced by the United National Independence Party (UNIP). The protest movement eventually paved the way for independence in 1964, with Kenneth Kaunda becoming the first president of Zambia.